A big thank you from St Anna’s Child Cancer Research for your generous donations. A big thank you to all our guests at our Advent Sale. It was a great start to the festive season. Our candle lit courtyard, warming fires, Christmas prices, Gluhwein and Lebkuchen charmed guests and friends alike. 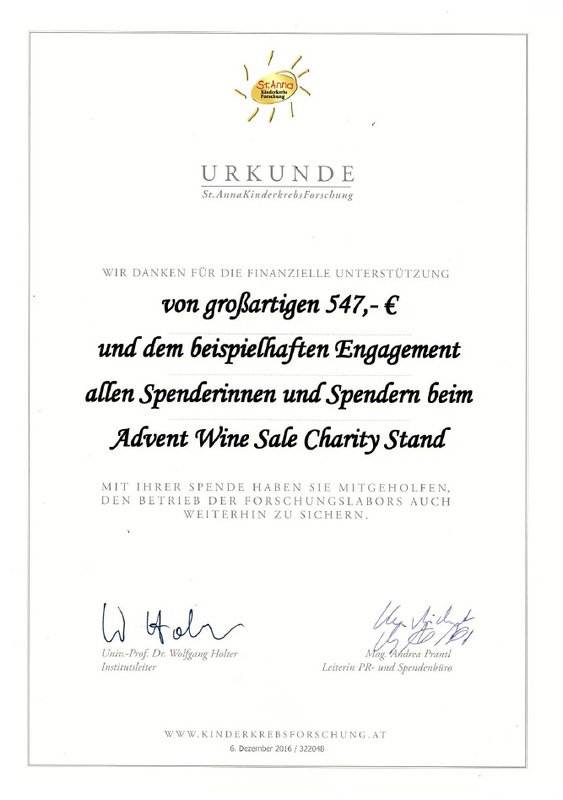 Naturally it was a great opportunity to taste all Hoepler wines and we were overwhelmed by the fabulous 547 Euros raised for St Anna’s Child Cancer Research at our Hoepler Advent Stall selling advent wreaths and Christmas biscuits all made by our hard working colleagues. Please don’t forget to put this in your diary for 2017. Bring friends and family along and enjoy the atmosphere you won’t be disappointed.